The Idols Top 5 2018 have made it to the next round – and are getting ever closer to that final session. Who is going to grab the title? After 11 million votes over the past week, the Top 5 contenders for the SA Idols 2018 crown have been announced – and Nosipho is not be among them. The 18-year-old took her final bow after getting the least votes; but not before receiving a vote of confidence from none other than Beyoncé’s dad and Destiny’s Child architect Matthew Knowles, who was a guest judge on tonight’s show. Those left performed two songs each under the theme How It Should Have Been Done. 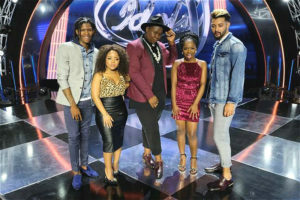 The contestants took butchered songs by Wooden Mic contenders and showed Mzansi how they should have been done. First up was Thando, who sang Jennifer Hudson’s Spotlight and Weakness In Me by Keisha White. Randall felt the “depth of feeling” was going to keep her in the competition for at least another week. Unathi called her performances bright and luminescent. Somizi and Matthew advised her to bring more energy into her performance instead of relying only on her pipes. Niyaaz took a swing at Sam Smith’s Too Good At Goodbyes and Robin Thicke’s Lost Without You. 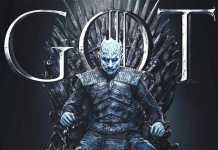 Unathi said she would “love” for someone to sing at her like that every day; Matthew said he’d chosen great songs; Somizi enjoyed himself and Randall said the only thing Niyaaz had to think about was how to pick up the votes from fans of the fallen Idols. Singing a Beyonce song in front of the man who “made” her must have been nerve-wrecking, but King B got a thumbs up from Matthew for his rendition of Irreplaceable. He also chose Say Something by A Great Big World. Randall offered up some advice along with praises. “There are performances when I think you can win this, and others where you’ve let me down. Consistency at this stage is critical,” he cautioned. Yanga, whom all the judges predicted would be in the final two, chose What Is Love by the Empire cast and Whitney Houston’s eternal I Will Always Love You. “That was unbelievably beautiful,” proclaimed Somizi. Randall praised her song choices and her “fantastic” interpretation of Whitney’s ever-green classic. “You were a star!” declared Matthew. Bringing the show to an end was Thato, who seems to be blossoming at just the right time. The judges unanimously declared him the winner of the first round after his performance of The Soil’s Inkomo. He followed it with Imibuzo by Nathi, which brought out profuse praise from Randall. “You are the one performer who sees beyond this competition, and you’ve got the biggest smile of all the contestants.” Unathi said she was imagining his name being called out at a festival, while Somizi said he was memorable. Now that the number of contestants can be counted on one hand, the heat is seriously on. Fans have their work cut out for them as they fight for their faves to stay in the race.